Charlie Chaplin On The Secret Of His Popularity. 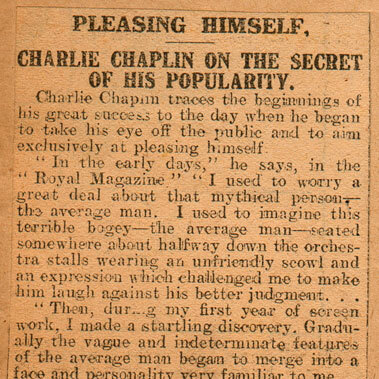 Pleasing Himself, Charlie Chaplin On The Secret Of His Popularity. Charlie Chaplin traces the beginnings of his great success to the day when he began to take his eye off the public and to aim exclusively at pleasing himself. “Then, during my first year of screen work, I made a startling discovery. Gradually the vague and indeterminate features of the average man began to merge into a face and personality very familiar to me.